Are You Looking For CFD Education Products To Give You The Best Opportunity In The Markets? Below you will find links to a selection of our CFD education, training and CFD recommendation services that will help guide you to become a more confident CFD, Forex or Futures trader. Whether you are just starting out trading Contracts for Difference or you are a seasoned veteran, the range of products below will suit your every need. Finding the best CFD education products for your particular needs has now got a lot easier. The most important aspect of finding the right service or training product for your needs is identifying exactly what you are looking to achieve. The clearer you are on this aspect, the easier you’ll find it to align with the right product for your particular needs. To find out more about each product, simply click on the image on the left or the ‘Click here for more info’ button and you’ll be taken to an overview page. Before purchasing a product, please read and agree to the terms and conditions on this page. 256 page softcover book which is considered the essential guide for anyone looking to trade Contracts for Difference, Forex & Commodities. * Learn how to build clear, concise & effective CFD & Forex trading plans. 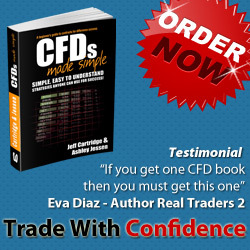 * Trade CFDs & Forex with confidence and avoid the common mistakes traders make. * Make the move from shares to CFDs & discover how the professionals use leverage. on [email protected]. We look forward to hearing from you. LearnCFDs wishes you all the best with your trading. By purchasing any products, courses or any form of training with LearnCFDs.com you understand that we are providing you with factual information only about securities and derivatives and the markets on which they trade. LearnCFDs do not provide investment advice and no recommendations are given on what to buy and sell in relation to your personal financial circumstances. Any stocks, derivatives or Forex products mentioned are for illustrative purposes only and no guarantee of future earnings is being made. LearnCFDs.com is owned and operated by Catena Operations Ltd and our Australian entity Catena Media Australia Pty. Ltd, (620 091 787) 9 Palisander Place, Castle Hill, NSW 2154, Australia. LearnCFDs.com provides general advice only and the information contained in the products listed above may not be suitable for your individual circumstances or specific situation. You should seek independent financial advice from a licensed investment professional prior to investing in any of our products. LearnCFDs.com and any person working for or with Catena Operations Ltd will not accept any liability for loss, damage or expense incurred by you if you decide to take action on the material in the courses or monthly subscriptions. By purchasing any of the products on this website, your purchase indicates you are agreeing to the conditions contained herein.